Apple’s clever code-monkeys in Cupertino have managed to make their mobile operating system, iOS, a relatively stable one. Apple’s own apps tend to behave themselves, running when they’re asked to, and quitting only when told to. It’s how the world of software is supposed to work, and for the most part, iOS does. The problem comes when third-party applications are introduced to the mix. Add in the multitasking element and it’s really a miracle that anything runs, and stays run, at all. But what happens when something goes wrong? If it’s an app that’s running in the background, or however Apple’s multitasking function works, chances are the app has crashed but you just don’t know about it yet. Requiring no set up or options other than a switch for logging just which apps have closed, and when, QuitUnexpectedly monitors running applications, and alerts the user via popup when one closes or crashes, depends on the way you see it. Apps can crash due to a variety of reasons, or iOS could close it due to a lack of free memory. QuitUnexpectedly notifies you if an app unexpectedly quits (crashes), either due to crashing or memory consumption (or whatever the case), then gives you the option to either re-launch the app or dismiss the alert. QuitUnexpectedly then gives users the option of carrying on regardless, or launching the app right there and then which is a pretty handy option to have if you’re asking us. This tweak could also be used as a tool for working out which apps are eating a lot of your system memory, and possibly causing other apps to behave erratically and, perhaps, even crash themselves. 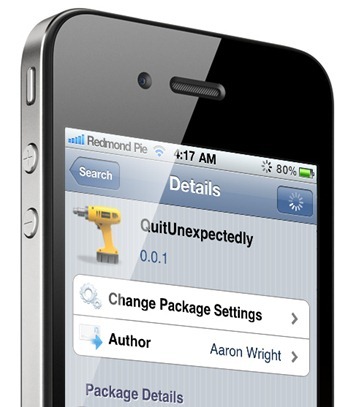 In order to take full advantage of this tweak, you first must jailbreak your iPhone. You can follow our step by step guide posted here to jailbreak your iPhone, iPad or iPod touch on iOS 4.3.5 using Redsn0w (or PwnageTool), or on iOS 4.3.3 using Redsn0w, PwnageTool, Sn0wbreeze & JailbreakMe (that last one being the easiest).